Decorating for the holidays can be a joyous event. It’s a time to be happy, spread cheer, and to get your home ready for the upcoming festivities. There’s no denying that when it’s time to take all that décor down, however, it’s not nearly as fun. Instead, it means business as usual. While in the meantime, you’re working to get your home, office, classroom, or all the above back in order. Really, it’s a short cry away from cleaning, a task that almost no one loves. But, when putting away décor in a timely and organized manner, it’s a job that can go smoothly. It can also be done efficiently, where everything has its place, can be stored away securely, and you don’t have to worry about items being broken when moved back into the attic, basement, or wherever else they might call home. Rather than trying to put away a box at a time, take down all your holiday décor and put it into a central location, such as a kitchen table or the living room floor. Once all the goodies are in place, you can then fit like items together, eliminating the needs for excess boxes or tubs. There’s no denying that when it’s time to take all that décor down, however, it’s not nearly as fun. Instead, it means business as usual. You’re likely to have left something out, no matter how thorough you were. Go back and look just one more time. Trust us. Consider using egg cartons to store ornaments or breakables, keep extra newspaper on hand to soften any harsh movements, and so on. It’s important to make sure all your belongings (especially the breakables) are safe and secure until next year. No one wants to dig through box after box to find something specific, avoid that annoying task and write on each box what’s inside. Be sure to write legibly and with detail so that you, a year from now, knows what’s inside. Permanent marker over duct or masking tape is an easy way to accomplish this time-saving tip. Hangings, garland, and more can easily be shoved into a box – a tactic that also allows you to fit more into fewer boxes. However, it also smashes leaves and pine needles leaving them mangled for the next holiday season. 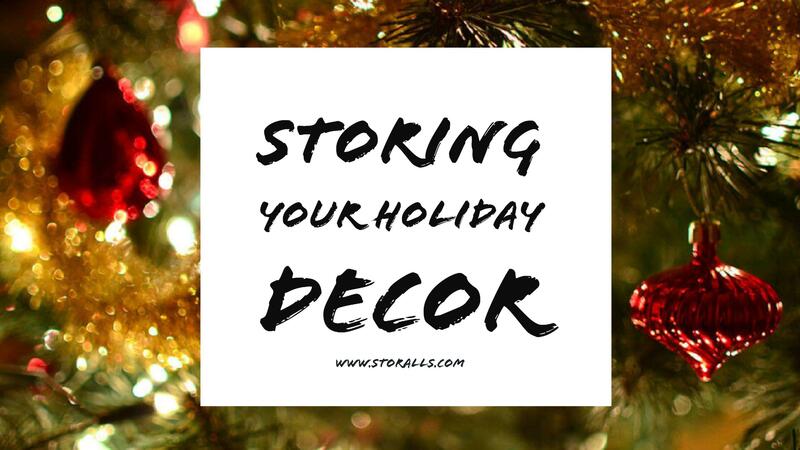 When possible, leave breathing room so you can enjoy more luster within all your holiday décor. Nothing is more frustrating than remembering your rushed job from the year before, realizing that lights are tangled, bulbs are without padding, etc. Instead, wait until you have enough time to do the job right, and can put everything away properly. Not only will this help your items to last, it will make next year’s unpacking far easier, too.For even more storage tips, get in touch today!